Image caption The Queen spoke of an "enduring love of Scotland"
The Queen has said she believes Scotland will unite in a "spirit of mutual respect and support" following the independence referendum. She said she understood there would be "strong feelings and contrasting emotions". But she had "no doubt" this would be tempered by "an understanding of the feelings of others". Voters in Scotland rejected independence by 2,001,926 votes to 1,617,989 in Thursday's referendum. The Queen's statement came after Scotland's First Minister Alex Salmond announced he would be stepping down after his pro-independence campaign suffered defeat in the referendum. The Monarch is currently staying at Balmoral Castle in Aberdeenshire. She said: "After many months of discussion, debate, and careful thought, we now know the outcome of the referendum, and it is a result that all of us throughout the United Kingdom will respect. "For many in Scotland and elsewhere today, there will be strong feelings and contrasting emotions - among family, friends and neighbours. Image caption The Queen previously said the referendum was "a matter for the people of Scotland"
"That, of course, is the nature of the robust democratic tradition we enjoy in this country. But I have no doubt that these emotions will be tempered by an understanding of the feelings of others." She added: "Now, as we move forward, we should remember that despite the range of views that have been expressed, we have in common an enduring love of Scotland, which is one of the things that helps to unite us all. The Queen faced the prospect of becoming Elizabeth I of Scotland or even Elizabeth, Queen of Scots, had the Scottish people voted in favour of independence. As a 27-year-old, she was crowned more than 60 years ago in Westminster Abbey when she took a solemn oath to "govern the peoples of the United Kingdom of Great Britain and Northern Ireland". Her coronation gown demonstrated the importance of the Union, with the intricate embroidery centring on the four emblems of the United Kingdom - the rose, the shamrock, the leek and the thistle. The Queen's Scottish heritage has been an important part of her life. Her mother, Queen Elizabeth the Queen Mother, hailed from an ancient aristocratic Scottish family. The annual Ghillies Ball, which she hosts for staff at Balmoral, was moved from polling day to Friday amid suggestions the switch was made to allow staff to vote in the referendum. "Any suggestion that the Queen would wish to influence the outcome of the current referendum campaign is categorically wrong. 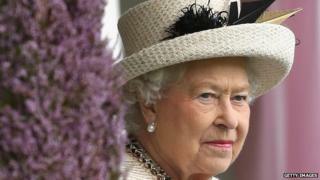 Her Majesty is simply of the view this is a matter for the people of Scotland," the Palace said. During the Queen's Jubilee year of 1977 there were growing calls for power to be devolved to Scotland and Wales. The Queen made her views clear in a speech to both houses of Parliament when she said she understood the aspirations of Scotland and Wales, but added: "I cannot forget that I was crowned Queen of the United Kingdom of Great Britain and Northern Ireland. "Perhaps this Jubilee is a time to remind ourselves of the benefits which union has conferred, at home and in our international dealings, on the inhabitants of all parts of this United Kingdom." The Queen is descended from Mary, Queen of Scots, James I, who was James VI of Scotland, and Robert the Bruce, who secured Scotland's independence from England.